An absolutely historical night of music. A bitter-sweet night of music. A magical combination of guitar-shredding artists who came together for the memory of one man. Allen Woody! Allen Woody!! For those of us who tend to seek out a bass line in a song, the name Allen Woody should register in your brain’s musical library. Specifically, in the southern rock genre. 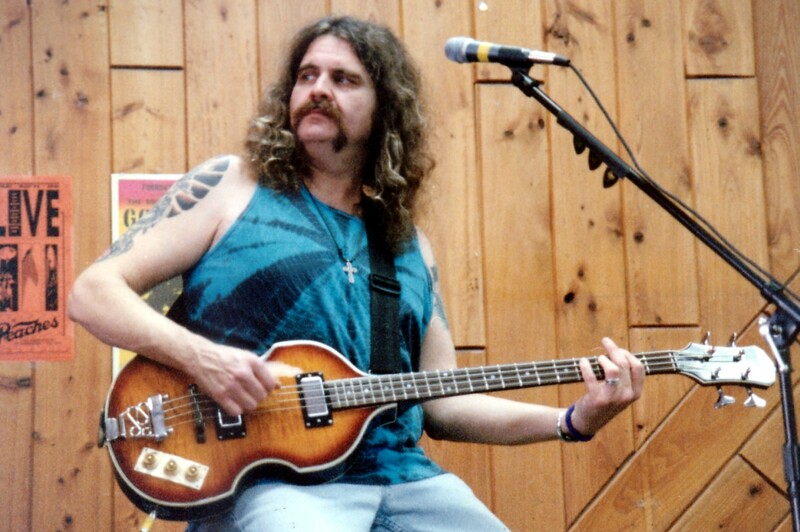 He was the stand-out bassist for bands such as The Allman Brothers Band, Gov’t Mule, The Artimus Pyle Band and more. This was a man whose musical presence touched the lives of numerous musicians, inspired a genre and who’s musical contribution deserves recognition. 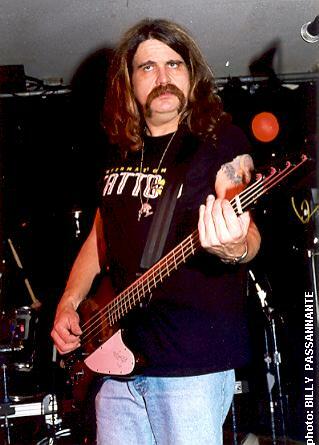 Tonight, people paid over $140 a ticket to pay homage to this dearly missed bass player whose tragically early departure from music left a gaping whole in the sound of southern rock. The proceeds from this 10th Anniversary event went to raising money for musical education in schools. For every person we heard complaining about the price, we politely reminded them of this fact. Having just had the privilege of attending T-Bone Burnett’s “Waiting For Superman” Benefit at The Beacon (click for my review) a few weeks earlier, it is safe to say that the quest for keeping music & art in the school system is not going to ever be ignored. We are all soldiers in that fight. Arriving at 6:45pm, I had quibbled with my man over arriving to the venue early. He didn’t want to stand around for hours and I wanted to make sure we had ample time to arrive early enough for good viewing locations. Roseland Ballroom is one of those venues, like Terminal 5, that has a sardine-like feeling with horrible site lines due to low ceilings and poor design. Doors were meant to open at 6pm but didn’t open until after 7pm. When we arrived, the line to the venue was wrapped completely around the block. Of course, even being an hour early, we were still slightly late but the first of our friends. Our section of the line starting to bulge as more friends joined our space. Dino Perucci (Dino Perrucci Photography) and Allison Murphy (Allison Murphy Photography), two of my favorite NY based photographers, were walking the front of the stage. My smile swelled because I knew that I didn’t need my camera tonight. Throughout this article, many of the pictures you will see are shots through their lens. Thanks to both photographers for allowing this Tiny Raging blogger to stand there and take it all in, not having to worry about the pictures. And thank you, not simply for this show, but for the hundreds you do every year. Thank you, from all the people who admire your talent and work, for doing what you do and bringing the music to our eyes. The show was supposed to start at 7pm and the doors didn’t even open until after 7pm. After a lovely chat with the lovely Allison Murphy while the unusually long sound check and stage set-up it seemed about that time. Those of us in the front were debating which musicians would be standing/sitting/playing where. 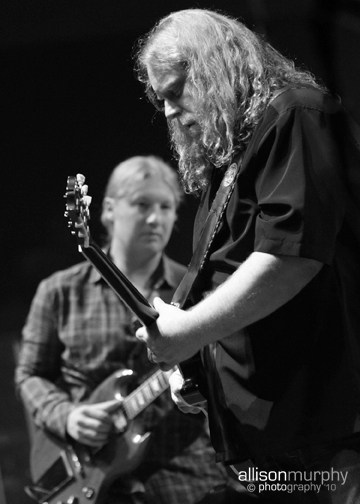 As long as I could see a full-on shot of Derek Trucks, Warren Haynes and Luther Dickinson, I didn’t care where I was standing. 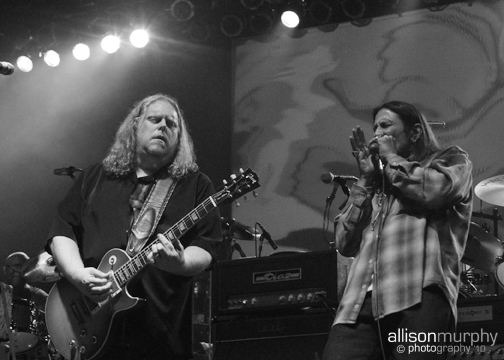 Out walks Warren Haynes with two other musicians that I am unsure of. It wasn’t until maybe an hour later that I found out that the men were Edwin McCain and Kevin Kinney. This was the acoustic set and it was beautiful. As soon as Warren Haynes started his strumming into Kevin Kinney‘s Just Outside Of Heaven (A Good Country Mile), I got that religious swell that I sometimes reach when the beauty of the music overwhelms me. This time, it was just as much the energy in the room as the music. I looked behind me and saw the faces of all my friends just beaming with excitement and love. Edwin McCain sang The Lucky One. All three sang on a gorgeous rendition of I Shall Be Released. Around 8:15pm, the Dickinson Brothers, tonight calling themselves the North Mississippi Allstars Duo, took the stage. The Dickinson family had a wonderful connection to Allen Woody over the years. 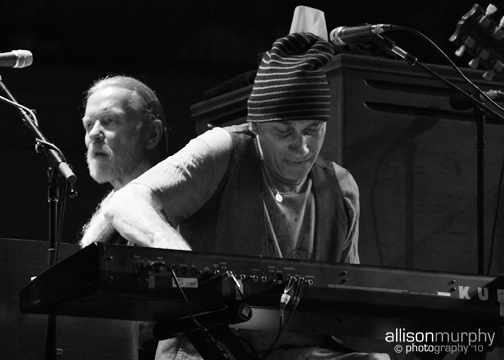 The late Jim Dickinson, the Duo’s father, was good friends with the members of the Allman Brothers Band back in the day and when the North Mississippi Allstars toured with Gov’t Mule, they have fond memories of Allen Woody sitting in with them. The Brothers Dickinson brought the Memphis blues to our ears with Sitting On Top of the World, a 1930’s standard. The gospel tone came out with Shimmy She Wobble > Station Blues > Preachin’ Blues, all North Mississippi Allstars originals. It was at this time that standing in front of the speakers began to take effect and I had to pop in the ear plugs. It never fails and as usual, I ended up passing out the rest to friends and strangers around me who were clearly in need. And then it was time for the guests. 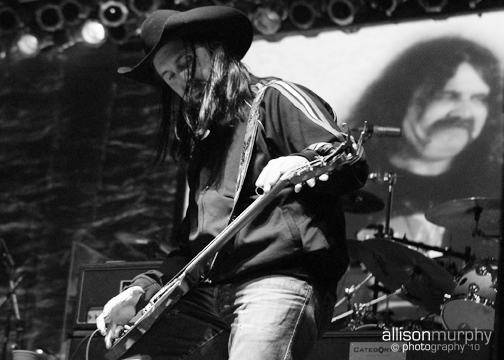 Gordie Johnson, Big Sugar guitarist and recent Gov’t Mule producer, came out to join the Duo for Po Black Maddie. Initially, it looked as though Gordie was going to sing the song but it almost appeared as if he was unsure of the words. Did anyone else catch this mumbling into the microphone?? Luther ended up singing the song. Gordie Johnson remained for Straight to Hell. Cody Dickinson‘s smile never left his face the entire set. It almost looked plastered on but we all know he was truly happy. How could anyone not be? There was a stand-alone drum solo by Cody Dickinson while Luther and Gordie Johnson switch sides of the stage for the final song of the set. The end of their set was FIRE!! 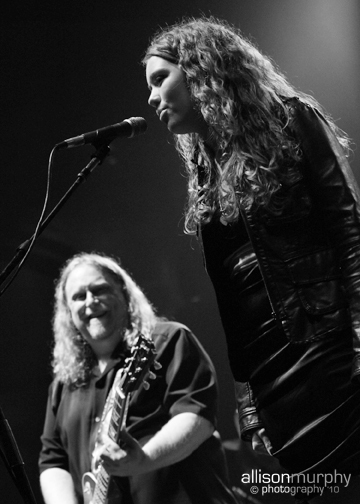 The Duo welcomed Artimis Pyle (Lynyrd Skynyrd) on drums, Danny Louis (Gov’t Mule) on keys and Audley Freed (Cry of Love & the Black Crowes) to the stage to perform Whiskey Rock A Rolla! There was now an arsenal of musicians on the stage to sing about whiskey and rock-n-roll! Four guitarists as Cody Dickinson moved from his drums to a guitar, tambourines, keyboards…What a mess of Southern rednecks. Their vests, boots, long stringy hair, cowboy hats…all screaming of their bluesy country background. 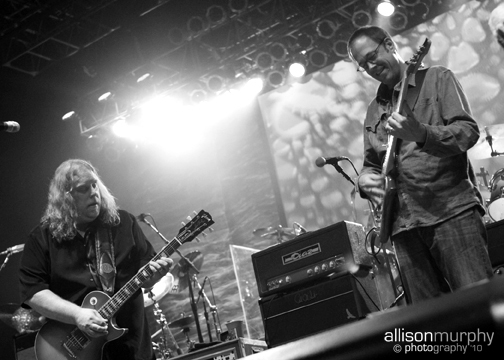 The members of Gov’t Mule take the stage after a few minutes of stage setting. Warren‘s iconic raspy voice heads into Railroad Boy. The screen behind the band was projecting a black background with “GOT MULE?” plastered across in white. Warren ripped a solo and the set just launched into southern goodness at its best. There was a spacey rip into Blind Man in the Dark, a personal favorite to sing around my apartment. Warren asked us how we were feeling and the place erupted with a happy reply. Danny Louis jumped off the keys and onto guitar for Steppin’ Lightly. 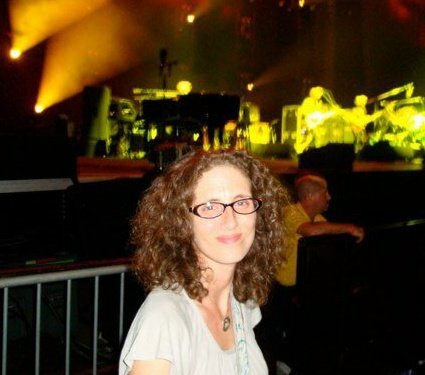 At this point, there were old picture of Woody shooting or lingering across the screen behind the band. His face smiling at us, showing his appreciation for the music in front of him. 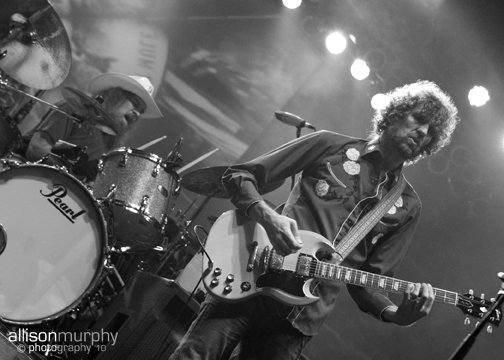 Sometimes there is nothing better then watching the hands of your favorite guitar player. Personally, my favorite guitar player had not yet hit the stage but here in front of me was Warren. He is simply amazing. Watching Warren, I was in tune with his hands much more then usual. I equate that to the fact that I have never been this close to his hands before. I was so happy to be in the front row. Banks of the Deep End sprang out of his hands and so it went…full on Warren! And now it was time for some GUESTS!!! Gordie Johnson once again joined the stage, this time followed by Jim Loughlin & Vinnie Amico, the drummers from Moe. They raged I’m A Ram before jamming into Dear Prudence where Chuck Garvey, also of Moe, joined with his guitar. I LOVE Moe. Dear Prudence with the members of Moe. AWESOME! THIS little addition to the stage made me very VERY happy. Seeing Chuck on stage with Warren was interesting. Their sounds are so different so vibing them together was great even though I silently wished it had been Al who was joining the stage. Chuck lead while Warren sang. There were whimsy art paintings across the screen behind the stage. Chuck gave a great solo and then tagged in Luther. The 320 Blues saw Hook Herrera join the stage with his mighty harmonica. Oh, the harmonica. I LOOOOOOOOOVE the layer of sound a harmonica add to a musical journey. 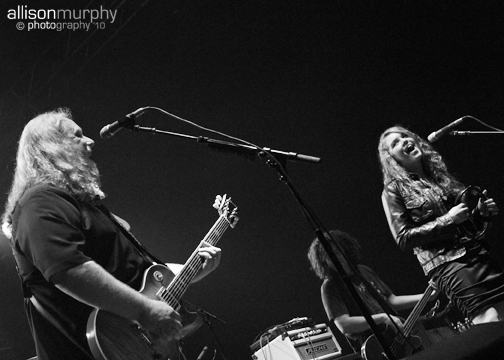 As well, Luther and Cody Dickinson joined the stage followed by Artemis Pyle (Lynyrd Skynyrd). GOD! It just kept getting better and better! So many musicians had been touched by Allen’s friendship, music and memory. Cody busted out his washboard and I finally heard the North Mississippi Allstars sound that I associate so much to that washboard. The place was on FIRE!! and the music was so loud and vibrant that the musicians drinks were shaking off the amps. As far as energy was concerned, this was the pop-off song of the night, so far. Warren then spoke of how Big Sugar used to open for Gov’t Mule and how he and Allen Woody would rage this Al Green song. He welcomed Rich Robinson (Black Crowes) to the stage for Stay With Me, Rick’s slide guitar sound melting everyone’s ears. Danny Louis was back on his keyboard. This song was so pretty. Warren ripped a solo and then they all hugged. The next song saw Rich Robinson staying on stage and being joined by Robert Kearns (Cry of Love) replacing Jorgen Carlsson on bass and Artemis Pyle (Lynyrd Skynyrd) jumping on drums. They flew into Sometimes Salvation, a Black Crowes cover, and the venue cheered. Wishing Well was next with the same people gracing the stage. And then we were given an emotional surprise. Savannah Woody, Allen Woody’s daughter, came out to the front of the stage to sing Soul Shine. And she sang the line: Now you gotta let your soul Shine / Just like my daddy used to say...the entire place erupted with the longest loudest cheer of the night and Warren’s tears took over the gleam in his eye. It took some time for people to realize who Savannah Woody was but when she sang that line, I knew immediately that it must be SOME kind of close relative to Woody. During the song, she was standing on stage, arms dangling while solos were being taken. A stage hand brought out a tambourine in the cutest way but she still didn’t move that much. When Allen died, a fund for Savannah’s education was established in his memory. She didn’t look any older then a high school student and it made me sad to know she lost her father so young. But the fact that she was up there, singing in her father’s memory, and not crying…we knew she was a strong. Certainly stronger then me as I teared up once I realized who she was and what she meant to the show. It must feel wonderful to see that your father touched so many lives. It must be wonderful to know that all those amazing guitar legends up on stage were actually men who look after their own and I am sure have taken her under their wing over the years. It was a lovely and touching performance of an otherwise tedious song. This show was supposed to end at 11:50pm, due to city/venue rules. This set ended at 11:30pm and we KNEW that we were not going anywhere for sometime because now….it was time for The Allman Brothers Band, but not before almost a 40 minute set break. The set break must have last over 40 minutes. Sadly, my date for the evening felt the weight of the tiresome day during the obsessively long break and had to leave. A set that was supposed to end at 11:40pm and didn’t even start until at least midnight. This was insane but I only knew good things would come from those of us who had been standing on our feet for over five hours at this point. When the music final started, my feet were aching, I was missing my date and fighting to hold my place up in the front row. 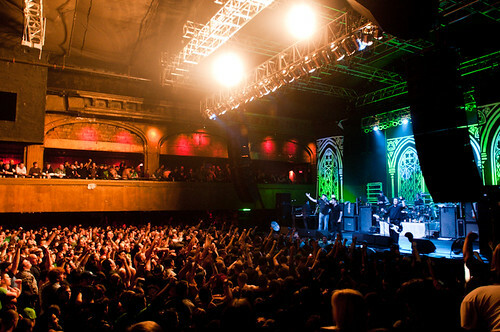 The masses pushed even closer as Derek entered the stage. And for the first time since I was able to meet him on his tour bus during Mountain Jam (click to read), I was back into a super fan. My legs buckled at first site, my smile exploded out the side of my face and I screamed like one of those chicks who faint when seeing the Beatles or Justin Beiber. Derek-Mania was going through my entire body. He is the one musician that makes me completely lose control. At this point, I am afraid I won’t be doing a great job of writing out exactly what went down. 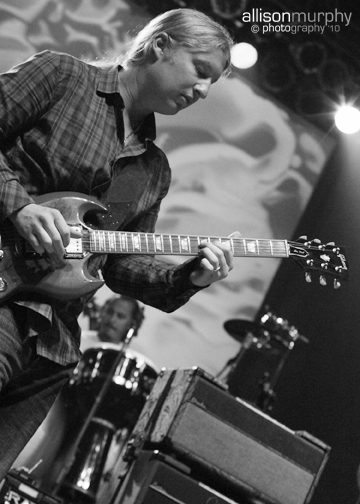 Like I said, I get a little more then weak in the knees when I see Derek Trucks and stopping to takes notes or trying to recall everything when all I want to be doing is staring at his fingers, well…..I didn’t write much at all. End of the Line was next. Warren changed out his guitars for this one and ripped out an astounding solo. Sometimes I just don’t understand how things can sound so different with every show. Same style but soooo different in sounds. At this point it is still only the members of The Allman Brothers Band gracing the stage and it proceeded that way for the following 5 songs. So at this point, there is a lull in the sound throughout the audience and I catch myself SCREAMING like one of those Beatles Mania fans again: “DEREK I LOOOOOOOOVE YOU!!!!!!!!!!!!!! !.” No One Left To Run With was next, one of the few songs Dickey Betts wrote for the group but never sang. There was a gnarly guitar duel between Warren and Derek. I mean it just never ends with these two. Warren was presenting us with such a phenomenal night of music and he was the ONLY musician to play in almost every song and at least in ever set. He was the hardest working man in show buisness that night! The drums in this song were killer. Black Hearted Woman, also a song written by Gregg Allman about the same woman he wrote This is Not My Cross to Bear about, followed and continued right into Other One Jam, a Grateful Dead cover, until they begin inviting out the guests!!! Greg sang his heart out and the video shows it! Hook Herrera came out and joined the boys for Who’s Been Talking. That man is an absolutely phenomenal harmonica player. I’ve said it a million times but I LOVE THAT INSTRUMENT. You can’t get a sound from any other instrument the way a sound is produced through a harmonica. It’s just soulful and the epitome of the blues to this southern gal. Midnight Rider, a crowd favorite,followed. Now, the original version of the song was with Duane Allman playing. I believe Gregg Allman re-made it a few years later (correct me if I am wrong). If you listen to older recordings, you can hear and feel Duane and Dickeys’ opposing styles very well. So amazing. Also, in 2005, this was used in the opening credits of Rob Zombie‘s horror flick The Devil’s Rejects. Who doesn’t love that kind of product placement!? Midnight Rider was followed by One Way Out. 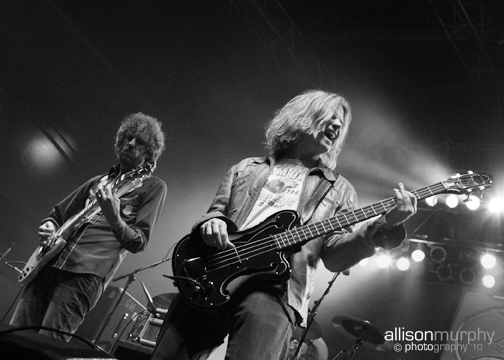 This song welcomed out Rich Robinson, Berry Oakley Jr. & Artemis Pyle to the stage. I don’t know why but the videographers apparently must have run out of time or video because the Allman Brothers YouTube videos begin dying off around this point. Statesboro Blues saw all guests leave the stage except for Berry Oakley Jr.. Berry Oakley Jr. is the son of Berry Oakley, a founding member and original bass player for The Allman Brothers Band who sadly passed away in 1972. It was a tribute for many people this evening and I was hoping people recognized the significance. Berry Oakley, Jr. left the stage and was replaced by Audley Freed & Danny Louis on guitar and keys respectively for The Band‘s The Weight. Chuck Garvey, Jim Loughlin, Jimmy Vanderbogart & Vinnie Amico came out to join The Allmans during one of my all time favorite Grateful Dead songs, Franklin’s Tower. Got to be honest with you and admit I have NO CLUE who Jimmy Vanderbogart is and I can’t find any info online that can give me more insight – If you know, please comment. Southbound followed with the addition of the Dickenson Brothers joining the crowd on stage along side Hook Herrera and Danny Louis. This was one of my favorite songs of the set simply because it was The Allman Brothers with this North Mississippi Allstars Duo and a freaking harmonica. SOUTHERN GREATNESS!!! All guests exited the stage and a RAGING Whipping Post closed out the set. Derek Trucks once again showing us he is the king of the slide guitar. Once again showing me that he is the king of kings in my world when it comes to the guitar. As my girlfriend and I walked away, we realized it was almost 2am in the morning on a work night. We discussed leaving before the encore and went to the restroom. Coming back up from the basement bathrooms, we smiled at each other as we heard the stage light up again. We couldn’t leave. Not this time. 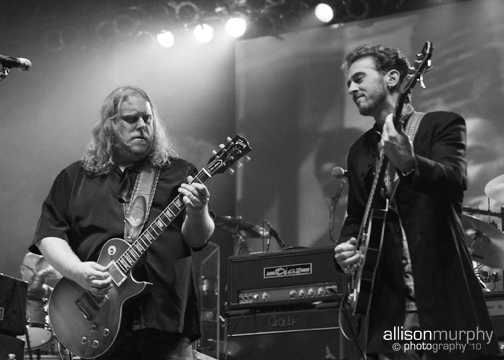 Warren Haynes began strumming the chords to Pink Floyd’s Wish You Were Here. And without uttering a word, the entire venue began singing the lyrics. Warren places his hand behind his ears and the venue sings louder. 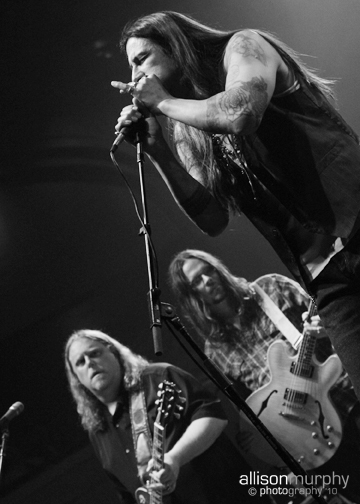 Berry Oakley, Jr., Gordie Johnson, Danny Louis and Matt Abts joined the stage for the remainder of the song with images of Woody’s face flashing smiles across the screen behind them. And I cried…for the third or fourth time that night. What an amazing night of music!! Simply amazing. 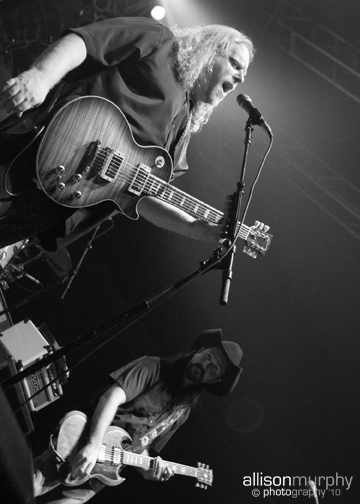 The epitome of love and community within southern rock was found on that stage this night. I truly wish I could offer you a free download but alas…..
Click here to DOWNLOAD/STREAM/LISTEN to the show!